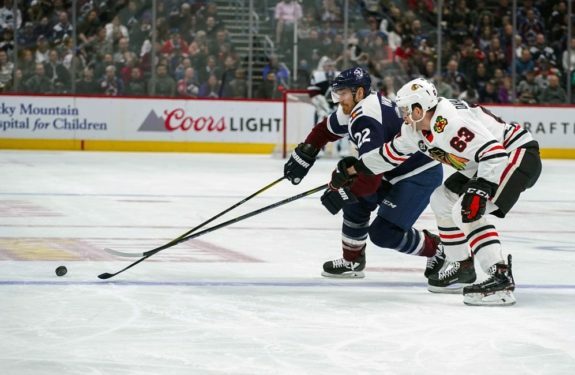 DENVER — Colin Wilson scored his first goal in more than a month, Philipp Grubauer stopped 29 shots and the playoff-chasing Colorado Avalanche earned their fourth straight win by holding off the Chicago Blackhawks 4-2 on Saturday. Soon after, the Blackhawks tied it up when defenceman Nikita Zadorov turned over the puck near the goal and Toews knocked it in. NOTES: Blackhawks C Dylan Sikura had an assist. … Zadorov made a young fan’s day in pregame by giving her a hockey stick as she sat in the first row. … NHL referee Brad Watson officiated his 1,393rd and final regular-season game Saturday. The players skated over and congratulated him after the game. … Rantanen was hurt Thursday when he was hit into the boards in a win at Dallas. … Captain Gabriel Landeskog remains sidelined by an upper-body injury.